1. Preheat the oven to 200ºC, gas mark 6. Mix together the mayonnaise and paprika and set aside, stirring occasionally. 2. Place the potatoes in a medium roasting tin with the butter discs from the pack and the diced chorizo, toss in half the oil. Roast for 30 minutes, turning halfway through until golden. 3. 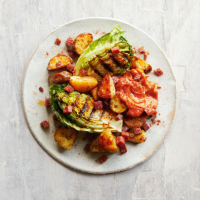 Brush the lettuce wedges with the remaining oil and griddle for 2-3 minutes, cut surface facing down, until slightly charred, transfer to 2 plates and top with the potatoes and chorizo, discarding any excess oil. Spoon over the paprika mayonnaise. Sprinkle with a little extra paprika to serve.